Are you a student, scout group or classroom looking for ways to help animals? There are many ways to help animals at the Wisconsin Humane Society and in our community. You and your friends can make a difference for animals and have fun in the process! From bake sales to wish list drives, or even an online fundraiser, there are dozens of ways you can put your creativity to work for animals. 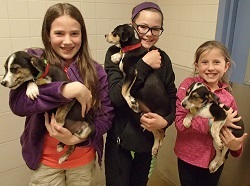 The Wisconsin Humane Society offers a wide variety of programs for young people who love animals and want to help support WHS. Learn more here! The Wisconsin Humane Society Milwaukee Campus hosts Service Saturdays for young people ages 12 to 18! Participants assist with hands-on service projects such as creating enrichment toys for the animals, helping to keep the shelter grounds looking their best, and more. Service Saturdays can help fulfill school or club community service requirements, as well. Each three-hour session includes a tour of the shelter, a chance to meet an animal, and a snack. This school year, Service Saturdays will be held on November 3 (2018), March 9 (2019), and June 1 (2019). Click on a date to learn more and sign up! There are all sorts of crafty ways that you can help animals! Make fleece blankets or plush toys for the cats and dogs at the Wisconsin Humane Society. Use your creative side to come up with more ideas to create toys, beds, or whatever you can imagine to help companion animals. Hold a Themed Wish List Drive! You and your friends, classmates, or neighbors can start your own wish list drive to collect much-needed supplies for the Wisconsin Humane Society. Choose from a theme below or check out our entire wish list here. Questions? Contact Ruadhan Ward at rward@wihumane.org.